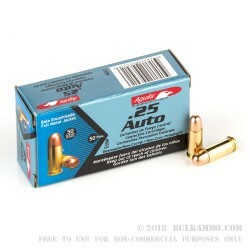 Originally created by Remington in 1961, Aguila ammunition, part of Technos Ammunition, is a Mexican made producer of quality ammunition for civilians and law enforcement applications. Probably best known for their .22 rimfire cartridges, Aguila also produces centerfire pistol and rifle ammunition as well as shotgun shells. 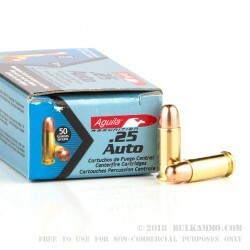 Aguila .25 auto ammunition is loaded with a 50-grain full metal jacket projectile into boxer-primed, noncorrosive reloadable brass cases. 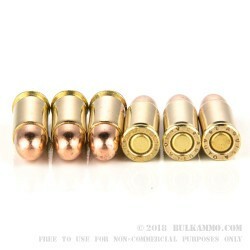 These lead core, copper FMJ rounds utilize Aguila’s ”non-Corr priming” system which allows for consistent ignition regardless of conditions. 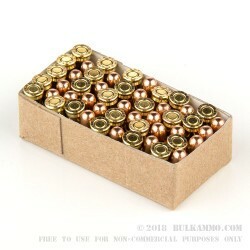 This bulk package features twenty, 50 round boxes of .25 auto and is perfect for the high-volume shooter looking to practice with their favorite pocket pistol. Love the .25 Bal. Rounds!!! !